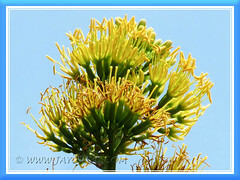 Agave desmettiana with flowers to signal its approaching death! Wouldn’t you be captivated with this 3-meter tall flowering beauty if you chance upon it? We were very impressed, indeed! 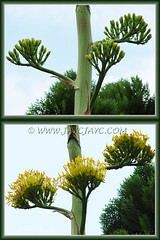 And, captured a lot of pictures too as we monitored its blooming progressively for several months. A pity though that Agave desmettiana is monocarpic and will exhaust all its energy for just a one-time flowering in its life-span, typically about 10 years of age and awaits its approaching death after showing off its blooms. However, the best part is, the mother plant will leave behind as its legacy, numerous suckers or pups around its base and even its flowers will often set bulbils or aerial plantlets. Wonderful, right? You’ll have an abundance of them to decorate your garden or share with friends and neighbours. 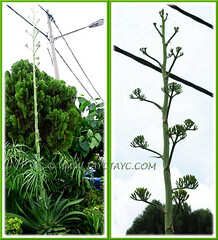 The Dwarf Century Plant is somewhat similar to the Octopus agave but smaller in stature. 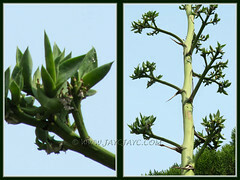 This much favoured and popularly cultivated agave with curvaceous foliage and minutely toothed leaf edges is primarily grown as a landscape ornamental plant for its architectural foliage display. And, when it does flower, that’s the added reward… to be able to enjoy its majestic flowering scape with bright yellow blooms over an extended period of time and be assured of its perpetual presence in the landscape with its production of new babies! There’s an attractive variegated form of this dwarf species, Agave desmettiana ‘Variegata’ with golden-yellow margins on the grey-green leaves. It’s even more striking and enchanting than the typical species, and shines as a beacon in low-light locations! 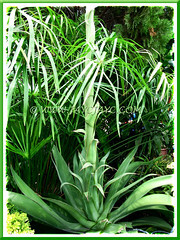 Common Name: Smooth Agave, Dwarf Century Plant, Smooth Century Plant. Etymology: The genus Agave is derived from Agavos in Greek, meaning ‘admirable‘, ‘noble‘ or ‘splendid‘. The species epithet desmettiana is named after the Belgian horticulturist and nursery owner Louis De Smet (1813-1887). Origin: Native to Mexico but has been in cultivation for centuries. Plant type: An ornamental herbaceous succulent shrub. 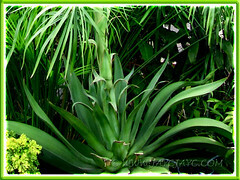 Features: Agave desmettiana is a slow to medium-growing succulent plant that grows to 0.6-0.9 m (2-3 ft) tall and has a leaf spread of 0.9-1.2 m (3-4 ft) wide, when grown on the ground but smaller in containers. It is stemless, with sessile leaves emerging directly from an underground rhizomatous stem and arranged spirally in a rosette-like formation. It will eventually produce suckers profusely, forming clumps with age. Foliage is evergreen, with yellowish to medium green or greyish to bluish-green leaves, with colour varying according to the amount of sunlight received, gaining a darker green in full sun. 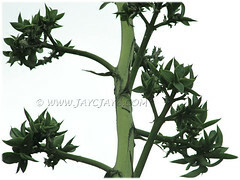 Lance-shaped leaf blades of the Dwarf Century Plant are fleshy, thick and smooth, with very tiny marginal thorns and brownish apical spines. Growing in an upright manner, the symmetrical rosette with recurved leaves will create an elegant urn-like or architectural form that’s most appealing, making it a favoured specimen. 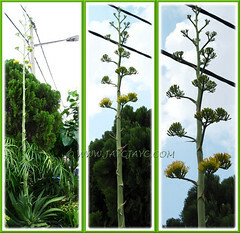 Towards the end of its life-span, typically about 8-10 years old, Agave desmettiana will produce a thick green flowering stalk, emerging from the center of the plant and towering 2.43-3 m (8-10 ft) in height, and bearing panicles of bright yellow blooms. The whole blooming process will last for several weeks to months, with the flowers at the base opening first. The inflorescences will not set seeds but are often bulbiferous, producing an abundance of bulbils that can be propagated into new plants. The plant will bloom only once in its lifetime and then dies after flowering to complete its life cycle. 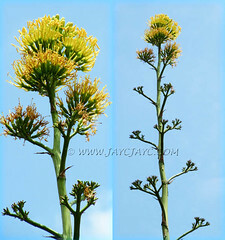 Culture (Care): The Smooth Agave grows easily with minimum care. 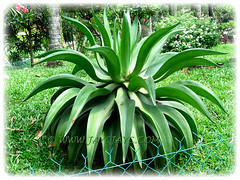 It enjoys the tropical and desert or arid climatic conditions when well-established. Light: Grows best in full sun but is tolerant of light shade or semi-shade. Moisture: Medium to low water requirements. When mature and established, it is drought tolerant and needs occasional watering. However, it thrives best with regular watering during the hot seasons. Soil: Prefers well-drained, infertile, sandy or sandy loam soils. Others: Avoid waterlogging to prevent root rot. You can clip off the sharp brown spine at the tip of leaf blades, when grown around play areas or walking paths, if desired. If a single garden specimen is preferred as a focal point, remove the unwanted suckers around it routinely to make its beautiful architectural character stands out. It is generally free from diseases and pests. For subtropical and temperate regions: Hardiness: USDA Zone 9-11. In non-hardy regions, it should be protected from heavy frost or overwintered indoors and water sparingly. Propagation: By removing suckers and aerial bulbils and grow them as new plants. 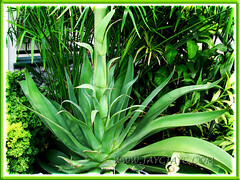 Usage: Smooth Agave or Dwarf Century Plant will be ideal for container planting because of its modest size. With a bold and statuesque form, it will make a great landscape plant, whether grown singly as a striking accent or mass in garden border/flower-bed. As it is highly drought tolerant, it’s excellent too for xeriscapes, rock and desert gardens. Thank you so much for your offer of an image, Robyn. As of now, we don’t see a need to add any more photos for this article since most aspects of the plant have already been illustrated. Thanks again for your generosity. God bless. We are over the moon excited to have this plant blooming in the house…in Minnesota. We would love more information on how to find the “seed” so we can grow a few more plants. Hi Pat. The flowers will not set seeds but are often bulbiferous, producing an abundance of bulbils that can be propagated into new plants. Just wait for the blooming period to be over which will be followed by emergence of aerial bulbils. Then remove them and grow as new plants. Info and images shown in our article above should be able to assist you in your endeavour. All the best! Thank you for the information. The blooming is now finished and I am seeing the little, what I am guessing is the aerial bulbils. IS there a good/better time to pick them off the mother plant and do I just bury them in a little bit of soil? We have this beautiful succulent in our backyard and both are in bloom! Humming birds come feed to their “flowers” and they attract more birds than the bird feeder! Little did we know this is a once in a lifetime bloom so as soon as I get home (Im at work, LOL!) I will take plenty of photos of this truly amazing work of nature. And will definitely replant the pups and the bulbils if I can. Thank you for all the info! You’re most welcome. We love sharing our garden experiences. Hope your pups will grow successfully and eventually bless you with more flowers to enjoy.